This research was funded by the National Institute for Transportation and Communities, or NITC, a program of TREC at Portland State University. Funding was also provided by US Department of Transportation Federal Transit Administration; Metro, the regional government of the Portland metropolitan area; Home Forward (formerly the Housing Authority of Portland); Housing Authority of Washington County; Vancouver Housing Authority; and the Housing Authority of Clackamas County. The purpose of this project is to develop and evaluate tools to assist Housing Choice Voucher (HCV) program participants in the Portland, OR, metro region with considering transportation needs and options when making decisions about where to live. The project consists of two elements: development of a set of tools in collaboration with the four metro-area housing authorities, and an evaluation of the effectiveness of the tools. The four housing authorities conceptualized and initiated this project, and then selected our team to fully design and complete it. Transportation costs are typically a household’s second-largest expense after housing and, on average, account for about one-fifth of household spending. 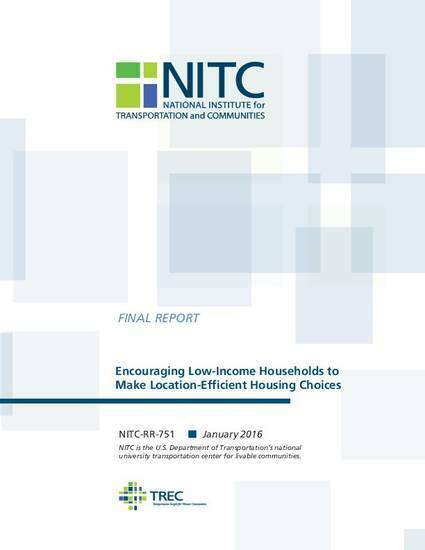 Low-income households are especially burdened by transportation costs, with low-income households spending up to two times as much of their income on transportation than higher-income households (Litman, 2013). Thus, reducing transportation costs is likely to have a disproportionately positive effect on the budgets of low-income households, both because of the share of their budgets it claims and because they have little to no discretionary resources to absorb higher transportation costs without impacting their ability to purchase other essentials, such as food and health care.